A heart warning story by Margret Ellem of her early life as a missionary. This is a must read. The Habitat Association. Growing up I was a bit of a “wild child”, until fifteen years old when I met my first love David! Up to this stage I hadn’t attended church (only Sunday School spasmodically). When the handsome minister’s son invited me to Dee Why Baptist Church I gladly went! (I would have gone anywhere he asked!) I recognized God’s claim on my life and about three months later committed my life to God and was baptized. New beginnings! After four years of keeping company with David, and frequently being jealous of the many girls who were attracted to him – I had to let him go, for him to discover what it was like to date other girls! I was his first girlfriend, however I had gone out with other boys. At nineteen I was devastated and I can remember sitting in vain by the phone crying, waiting in vain for him to call. I found it extremely hard to let him go because I truly loved him and had hoped for a future with him. I still find I have a problem in this area with people I love. Around this time , along came Roger Ellem (a student Pastor at Narraweena, a local Baptist church). He was good looking, and very committed to going to Bangladesh (then East Pakistan) as a missionary. I was attracted to him, and my mother heaved a sigh of relief when I stopped sitting by the phone crying! My parents liked Roger, in spite of the fact that after our first date he told them that if I ended up with him I would be living in faraway East Pakistan! It was a bit of a shock (to say the least) to hear that their beloved daughter may end up the other side of the world but they accepted it! They wanted me to be happy! 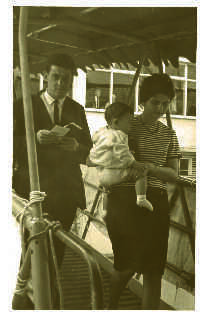 Consequently, after one year doing a Missionary Course at the Baptist Theological College in Eastwood in Sydney, we were married in February 1964. Then followed a series of short ministries in Baptist churches in New South Wales, Armidale in 1964 (a country church with the older ladies all waiting for me to take over ladies meetings etc). I found this very daunting, as a young inexperienced minister’s wife! Times were economically tough!